OHIO VALLEY — Winter Storm Jonas shared Ohio Valley’s first major taste of winter misfortune over the weekend with nearly a foot of snow dropping in Mason, Meigs and Gallia counties. According to the National Weather Service, roughly 11.5 inches of snow fell in Point Pleasant, W.Va., 10 inches fell in Rio Grande and 9.5 inches fell in Meigs County near Dyesville. The lock master at the Racine Locks and Dam reported 10 inches of snow Sunday morning. According to Gallia County Engineer Brett Boothe, about noon Friday, Gallia County trucks started plowing county roads. The trucks focused on plowing hard-road surfaces. Saturday, workers started early after working late Friday night. Hard surface roads were plowed out and a contractor signed with the engineer’s office was assigned to help run a grader over county gravel roads. Most gravel roads were graded Saturday. Trucks started treating roads afterwards. Boothe said by Sunday afternoon everything had been plowed again and treated. On roads like Jackson Pike, the engineer’s office treats it with straight salt. On other county roads, trucks will use four tons of cinder to one ton of salt. On chip and seal roads, trucks use straight cinders. When asked what cinders are, Boothe replied it was a form of ash. According to him, when sunlight shines on cinders, the ash collects more heat, much like a black T-shirt in the summer, and this quickens the melting process. Boothe said Gallia County will use roughly 1,000 tons of salt in an average winter and around 8,000 to 10,000 tons of cinder. Gallia County has roughly 450 miles of county road to plow and treat and 360 miles of township road, according to its engineer. Around 14 trucks ran 14 plowing routes with four graders skimming gravel roads and one wrecker to pull county vehicles out of poor road conditions. Boothe said workers ran roughly 16- to 18-hour shifts while aiming for eight hours of rest between tasks. 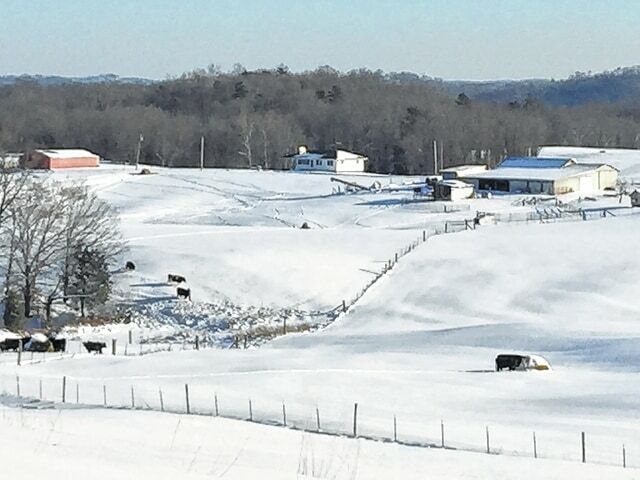 According to Meigs County Board of Commissioners president Randy Smith, everyone worked together during the snow storm as a team, and should be commended for their efforts. He said he speaks for everyone when he says that it takes a team and Meigs has the best one around. “We can’t say enough about County Engineer Gene Triplett and his staff at the County Highway Department, the township trustees and their staff, and the staff at the county ODOT garage. Everyone was very prepared and took care of our highways and roadways quickly.” Smith said. Jacks, director of Meigs County EMS/911, emphasized that all agencies, including firefighters and township trustees, worked extremely hard to clear roadways. This photo was taken from atop Lincoln Heights in Pomeroy on Sunday morning. Below is the village of Pomeroy and the Ohio River. Courtesy Photo by Paige Cleek. http://aimmedianetwork.com/wp-content/uploads/sites/42/2016/01/web1_Lincoln-Hts.-Pomeroy-2-.jpgThis photo was taken from atop Lincoln Heights in Pomeroy on Sunday morning. Below is the village of Pomeroy and the Ohio River. Courtesy Photo by Paige Cleek. Dean Wright in Gallipolis, and Linday Kriz and Lorna Hart in Pomeroy contributed to this story.